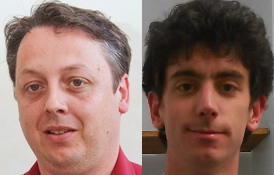 Olivier Bournez and Amaury Pouly have proved an interesting theorem about modeling physical systems. They presented their paper at ICALP 2017 last month in Warsaw. Today Ken and I wish to explain their theorem and its possible connections to complexity theory. They used their ability to guess solutions to discrete recurrence systems. I do not believe there is an exact meta-theorem connecting discrete recurrences with ODEs but at the heuristic level they were able to just look at a recurrence and say I believe the solution is And they were usually right. Let’s get back to what Bournez and Pouly (BP) have proved. Note that all three have the same “differential monomials” and approach each other as one chooses higher, as is most obvious on multiplying by . As we said, Rubel’s proof can be seen as an indication that (fourth-order) polynomial implicit DAE is too loose a model compared to classical ODEs, allowing in particular to glue solutions together to get new solutions. As observed in many articles citing Rubel’s paper, this class appears so general that from an experimental point of view, it makes little sense to try to fit a differential model because a single equation can model everything with arbitrary precision. First, … the proofs heavily rely on the fact that constructed DAE does not have unique solutions for a given initial data. … Rubel’s DAE never has a unique solution, even with a countable number of [initial] conditions of the form . Second, the proofs usually rely on solutions that are piecewise defined. Hence they cannot be analytic, while analycity is often a key expected property in experimental sciences. As with Rubel’s result they actually prove the stronger form where can be any continuous positive function so that the error between the solution and can decay off just like before. can be modulated for any irrational to bring both and arbitrarily close to multiples of without the denominator vanishing. That is, they can make the fraction grow fast while retaining analyticity. Émile Borel once conjectured that solutions to -variable ODEs that are defined on all of must have growth bounded by a stack of exponentials. This conjecture was refuted even for , and BP were able to apply the refutation. Their result can be viewed both as a positive result and a negative one. On the one hand they show that ODEs are very powerful and can model almost any reasonable computation. You can think of this as showing the power of analog computation. On the other hand, they show that models based on ODEs may likewise be too powerful. They too may be so powerful that they are not really useful. One weakness is that their polynomial is not so simple. They outline how their construction can be effectivized to give somewhere north of 300. Possibly it can be tightened much further. They point out an analogy with the kind of universality shown for the Riemann zeta function by Sergei Voronin, citing one of our two posts on it for reference. The zeta function is analytic but cannot be a solution to any polynomial ODE (nor DAE). We can try to motivate the task of improving and by noting how a minimum universal ODE is a natural and fixed version of a minimum universal program. What are some further implications of the new result for modeling nature? Is there some way we can stratify differentially simulatable systems according to some (concrete) measure of their computational complexity? The universality of fixed ODEs reminds me a little of the old result of Pour-El and Richards which showed that there are computable ODEs (in the Turing/Bishop sense) that have only uncomputable solutions. Of course this is very far from the analytic case discussed here. I like how when experts overuse the word ‘possible’ all the time it is accepted.